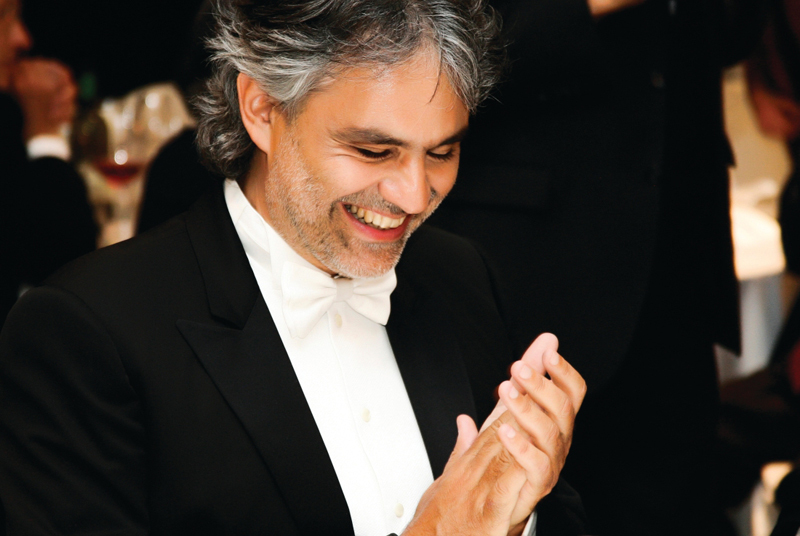 Andrea Bocelli is one of Italy’s most loved and well known living voices. His singing can make a person feel incredible emotion and passion and the fact he has overcome many obstacles to realize his talent, probably adds all that passion in his voice. This is the very essence of what he expresses; his soul is brought to consciousness through his voice. A voice we treasure! Andrea Bocelli, the man with a beautiful tenor voice that has reached out and captured the hearts of all ages, and has crossed the boundaries from classic to pop, moving millions with his sincerity of passionate performance. He has sung for Pope John Paul II and Pope Benedict XVI, Queen Elizabeth, two United States Presidents and numerous heads of states. The opening ceremony of the Expo 2010 in China in front of twenty heads of state and government was one of these events. Wherever he sings he attracts a full house. He sang for 80000 people at the ‘Charming China’ concert in the Shanghai Stadium .What is most intriguing is that his audience has not just been people. Andrea has had an affinity with horses from a young age and especially with Arabian horses. He was confident in the saddle from the age of six. He has been known to sing to his horses for reaction to new songs. Andrea Bocelli was born in the Chianti region of Tuscany in a village called La Sterza, Lajatico where the beauty of nature has ruled the hearts of those who live there. This region is in the heart of vineyards and the Bocelli family has their own vintage, Chianti Bocelli. Andrea has wonderful memories of his childhood and the nature that surrounded him. Born with poor eyesight due to a hereditary form of glaucoma, he became blind at the age of twelve following a football accident followed by a series of operations. He was then sent to the Cavazza Institute where he learned to play many instruments, besides piano, and had his first singing lessons. The best singing teachers such as those at the Cavazza Institute are those that teach locally. Andrea himself does not consider his blindness as an affliction, he considers himself fortunate to have had the gift of his voice. He accomplished what he set out to do, a characteristic which has added something special to the emotion we feel when he sings. When he was a law student at the University of Pisa he would frequent the piano bars and earned extra income playing popular songs. Being a good looking man, sensitive and talented, he was never short of female attention. When he fell in love, it was with Enrica Cenzatti , the woman who was to be his first wife and with whom he had two children. Enrica said she had never felt that Andrea was disabled in any way as he himself did not consider himself disabled. His accomplishments absolutely verify this, as he has achieved phenomenal success in his life as a performer, and his physical pursuits leave us in awe. He still rides horses, and cycles and is ever up for a challenge, including a sky dive! When he was very young and struggling with his sight he listened to and was influenced by the great voices of Mario Lanza, Beniamino Gigli, Francesco Gucinni, Jose Carreras, Luciano Bettarini, Franco Corelli and, of course, Luciano Pavarotti. Pavarotti had advised famous rock star Zucchero to ask Andrea to perform in ‘Miserere’ and this was really a crucial point in his life. 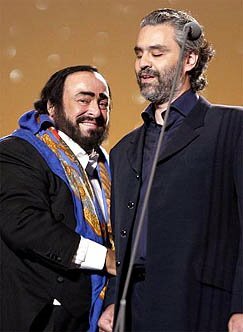 Pavarotti became a friend and mentor whom he referred to as Maestro. 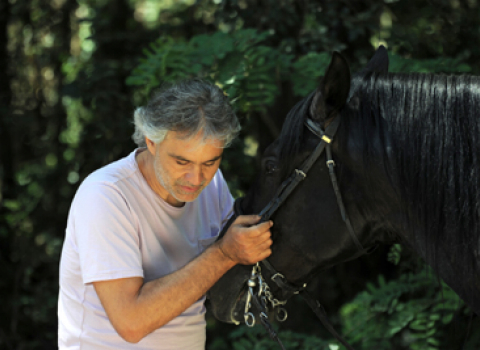 They also shared their passion for horses and Bocelli sang both at his wedding in 2003 and also at his funeral in 2007. From 1994 when Andrea won the Newcomers section at the Sanremo Music Festival to the present 2012 he has performed continually. His achievements have been outstanding and sometimes beyond belief in a mere 18 years. His voice has been heard in the Southern hemisphere, Australia, New Zealand and South Africa (for the world cup soccer). He has sung in China, Japan, Singapore, South America, Canada and the United States. Of course, he is a regular performer in Europe and especially in his native Italy where he has had great honour bestowed upon him, ‘Grand Officer of the Order of Merit of the Italian Republic' (2006). He was also given a Star on the Hollywood Walk of Fame for his contribution to Live Theatre. Besides all these deserved awards a beach has been named after him, in Jesolo on the Adriatic coast of Italy, an orchid named after him in Singapore, and he was on People’s magazine list as one of fifty most beautiful people. Andrea has also made a wonderful contribution to charity benefit concerts in different countries for various charities, the Michael Jackson benefit concert 1998, the Memorial Concert at Ground Zero in New York City for the victims of the 9/11 Attacks. The Music of Asia festival 2004 for the Indian Ocean earthquake appeal. Singing with Mary .J. Blige and David Foster to raise awareness for the victims of the Haiti earthquake 2010. An open air concert at Masada Israel, where the proceeds went to the residents of Galilee and Negev. Another in Sicily to support the ‘Flames of Solidarity’ to raise awareness concerning poverty. In Greece he gave a performance at the Odeon of Herodes Atticus to help Cancer research and one at the ‘Children in need rocks Manchester’ concert. The Andrea Bocelli Foundation was launched in 2011 with a vision to fund medical research and to fight poverty. Bocelli has sung with great voices of our time. Amongst the famous voices are Luciano Pavarotti, Celine Dion, Ana Maria Martinez Al Jarreau, Zucchero, Daniela Dessi, Sarah Brightman, Tina Arena, Laura Pausini,Cecelia Bartoli ,Katherine Jenkins, Jose Carreras. He has even performed Jingle bells with the Muppets! Famous songs, operas and performances. He has recorded eight complete operas and thirteen solo studio albums. ‘Sacred arias’ has sold more than any other classical album by a soloist. ‘Romanza’ with the track ‘Time to say goodbye ‘(Con te partirò) has sold 12 million copies world wide. In 2006 Andrea convinced his local municipality in Lajatico to build an outdoor theatre ’Teatro del Silenzio’. Every year he performs for one night only, the rest of the year the theatre lives up to its name, silent. This year the performance will be on the 12th of July at the Teatro del Silenzio. He will tour the UK and Ireland between the 6th and 15th November 2012. Andrea Bocelli has another reason to sing! 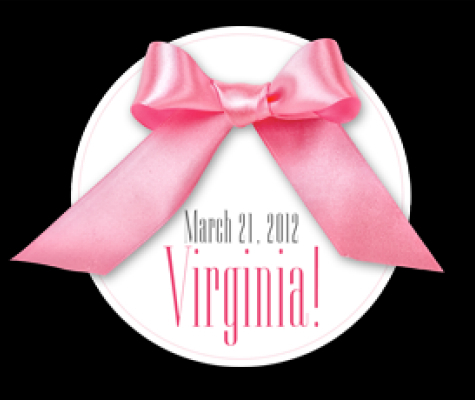 Andrea Bocelli and Veronica Berti have been blessed with a baby girl, Virginia, born on the 21st of March 2012, another wonderful event to add to his fascinating life.